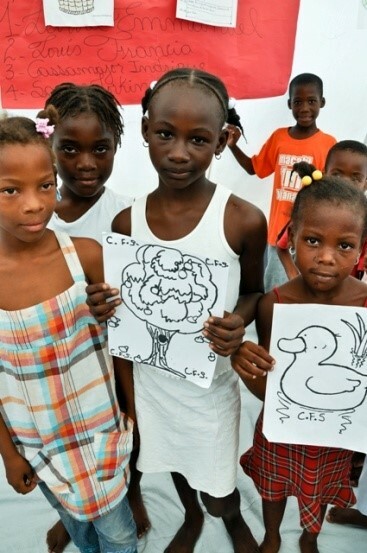 In January 2010, a catastrophic earthquake hit Haiti. This had an immediate impact on the lives of at least 3 million people who were already living in extreme poverty. Over 220,000 people were killed, 2 million were in need of aid, and more than 1.7 million were left homeless. Thanks to the Fu Tak Iam Foundation’s generous donation that helps the quake affected regain their faith in life and a hope for the future. 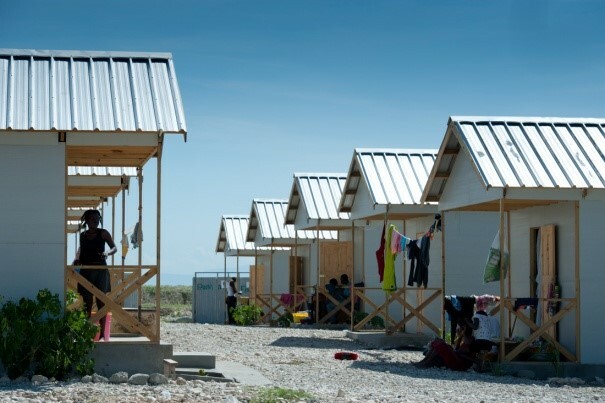 Transitional shelters are provided for quake survivors, 10 km outside of Port-Au-Prince. 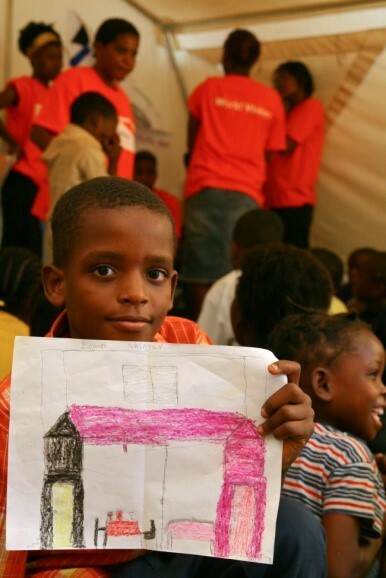 World Vision hopes to build approximately 3,500 shelters to meet the needs of children and their families. 30-year-old Alene is very happy to be able to lead a normal life again. 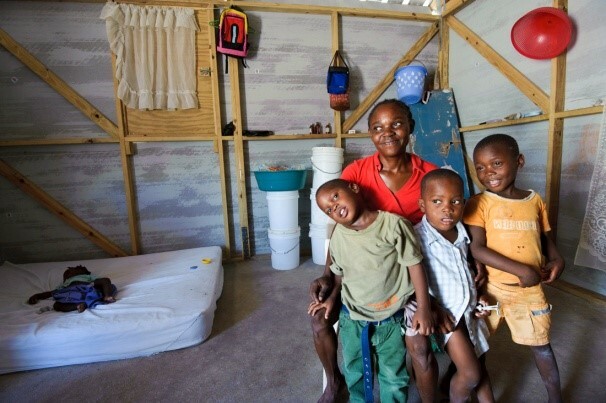 Photographed with her inside the World Vision-built transitional shelter, are her children 3-year-old Sivron (left), 6-year-old Davidson (middle), 2-year-old Darlene (sleeping on the mat), and the boy living next door, Robaine (right). 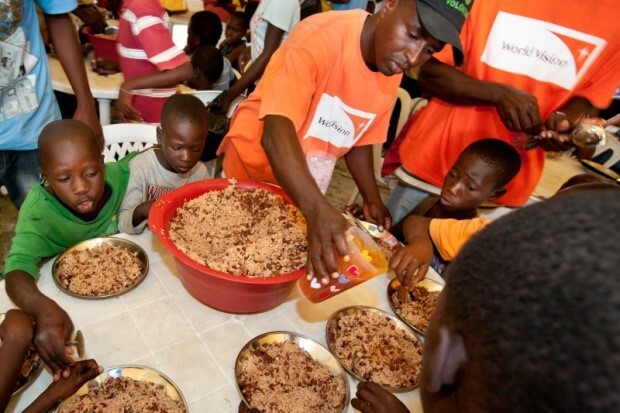 Children are enjoying a lunch of rice and beans at a camp 15 km outside of Port-Au-Prince. 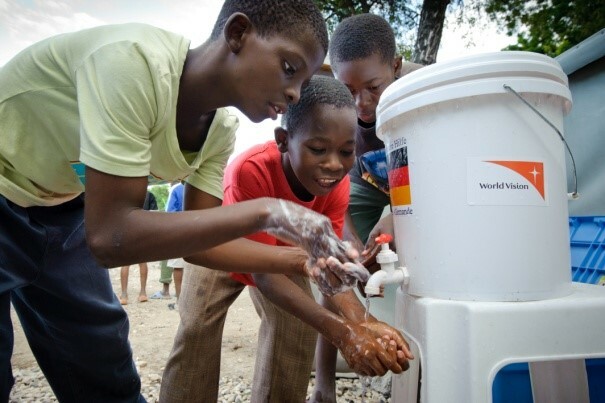 Children are queuing up to wash their hands at a Child-Friendly Space. Child-Friendly Space is provided for the affected children to help relieve their distress, enable them to learn and play in a safe environment. 9-year-old David draws the house he dreams of. 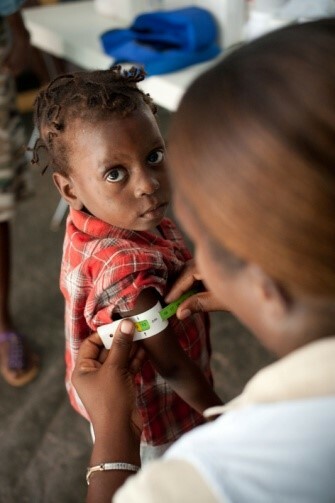 Professional medical staff is stationed in mobile clinics to provide quality services for survivors. Besides, the health status of many homeless children are monitored and cared for both in temporary shelters, and Women- and Child-Friendly Spaces. Pregnant women also receive pre- and post-pregnancy care. 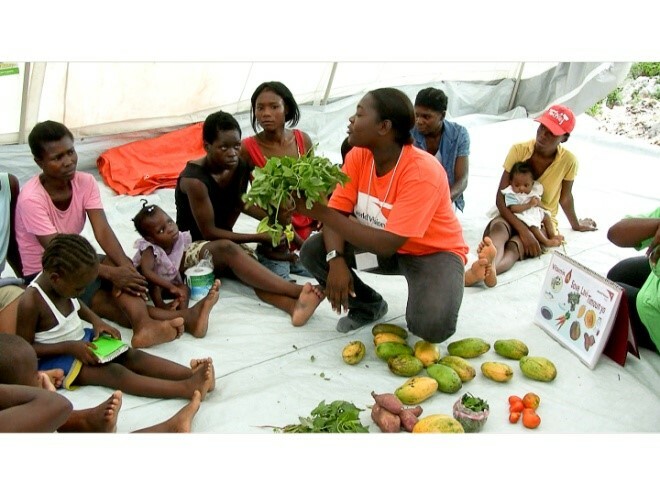 Nutrition classes are available for mothers to improve their knowledge on nutrition and hygiene. The lives of 10-year-old Bellanda and her family are enriched after participating in the many activities the camp offers. 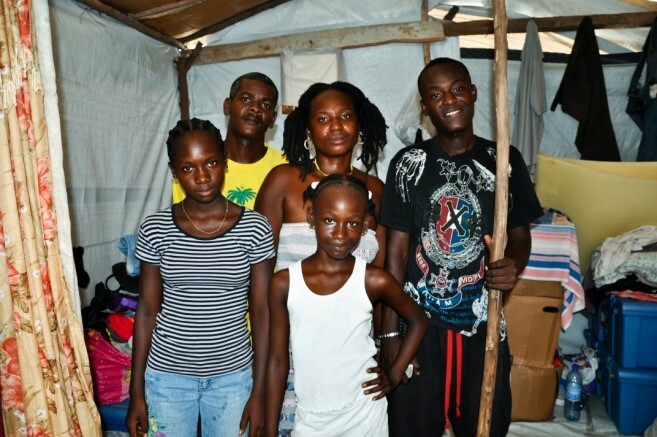 10-year-old Bellanda (dressed in white) and her family were deeply affected by the catastrophic earthquake, and had to leave their damaged home in the area around Port-Au-Prince. They then moved into a World Vision camp for internally displaced persons. Before the earthquake, Bellanda’s mother, Netude, had a small business selling household items, but after the earthquake, like many other families, Netude can no longer sustain her business. Fortunately, World Vision’s “Cash-For-Work” programme came to the rescue in time, providing much needed money to cover the family’s basic needs. Both Netude and her husband Gerard have participated in the programme - through which they get paid to maintain the cleanliness of the camp. 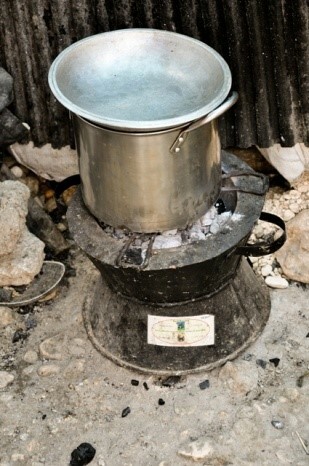 World Vision provides a small charcoal cooking stove for Bellanda’s family, so they can return to a normal routine. Bellanda (holding one of her drawings) enjoys jumping rope and playing hide-and-seek with her three best friends pictured with her here in a World Vision’s Child-Friendly Space.